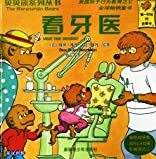 Sister Bear watches Dr. Bearson fill Brother Bear's small cavity. Then it's her turn in the chair to have a dangling baby tooth removed. An entertaining story for preschoolers of a cheerful and informative visit to a dentist.